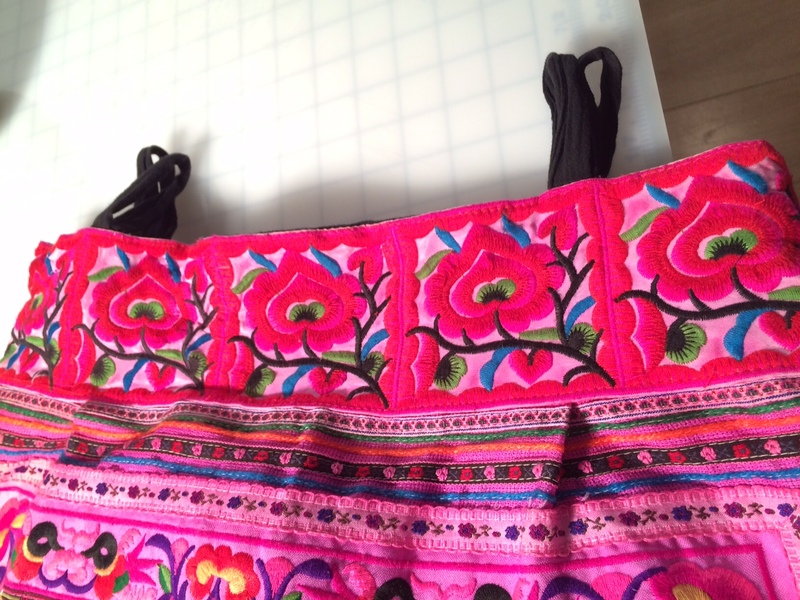 Cambodian Hippy Bag gets an upgrade! 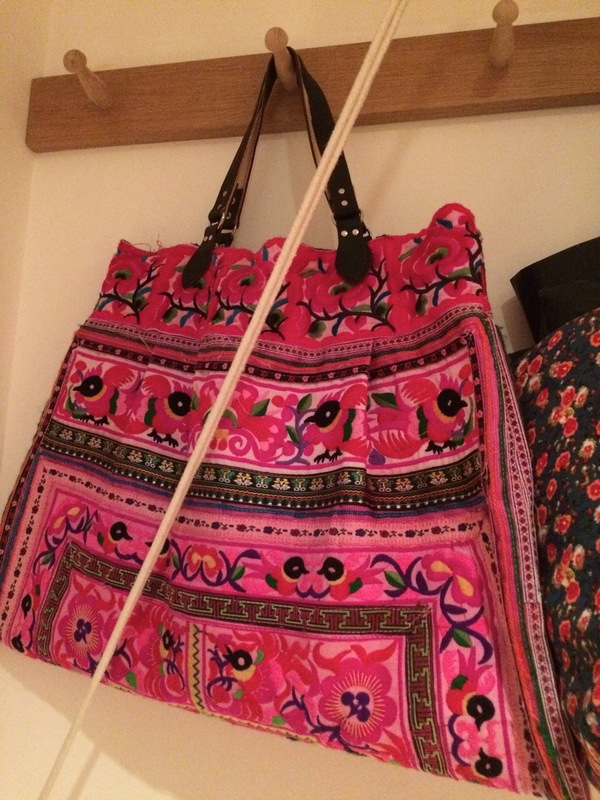 I have this really nice bag made, I think, in Cambodia, which I bought in Birmingham a few years ago. I loved the colours and machine embroidery, but I disliked the long hippy shoulder bag handle. It was made out of some plaited black cotton, with organge, green and black pom poms. So I detached the straps and thought about how I could turn it into a hand bag. I knew I wanted leather handles but didn’t get much further. Unfortunately this handleless bag was languishing, hanging on one of the Shaker hooks, held up with a nasty blue ribbon. So, as I Kondoed madly, I held the bag and decided it very definitely “sparked joy” in me. But it was useless without handles. I searched the internet and found just what I wanted. Nicely made, robust, leather handles, in a very wide range of colours, made in England by Simple Way. I wanted dark brown and I wanted silver rivets. As it is hard to gauge colours on the internet I spoke to the company who said that they had “distressed brown” (which doesn’t sound very nice does it? Maybe I should have asked for “happy pink” or “lively blue” instead) and sent me a little swatch and brochure (no charge). 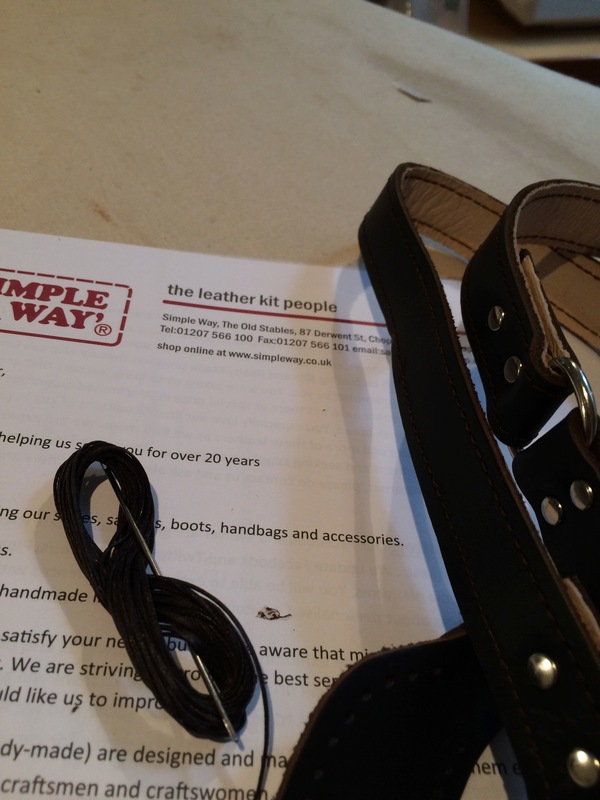 The colour was perfect so I ordered the straps (which are fairly expensive at £21, but they are hand made, specifically for each customer, and I asked for a pig skin lining. They arrived nicely packed with a thin bodkin (needle) and some dark brown, waxed thread – plenty of it. I snipped off the old handle pieces, and put the new handles just to the inside so that I didn’t have too many thicknesses to go through. Despite there being loads of paper work, there were no sewing instructions, so I assumed it was just a matter of doing a running stitch, and then going back over the same holes, but filling in the gaps. Anyway the upshot is that I now have a bag I love, that is big enough to take all my evening class equipment, and looks nice with everything, but especially with boring dark clothes. And it looks pretty, hanging in the hall way, on the Shaker pegs. I am not embarrassed about it anymore. I love the new handles – they feel and smell really nice. Great to see your purse. Love the handles. I have been struggling with vinyl trying to make my own. I am having a rethink. I never would have thought there was a company out there doing this. How great to be able to turn this bag into this. We really do lead parallel lives Kate! I made mine into a cushion and the pom pom straps are now curtain tiebacks in my son’s room! Bought mine on the Laos border – Thailand side, but really it could come from anywhere! Snap! Your solution sounds great too. I am glad we both love the same shiny, colourful things. So looking forward to meeting you Lovely Lesley. 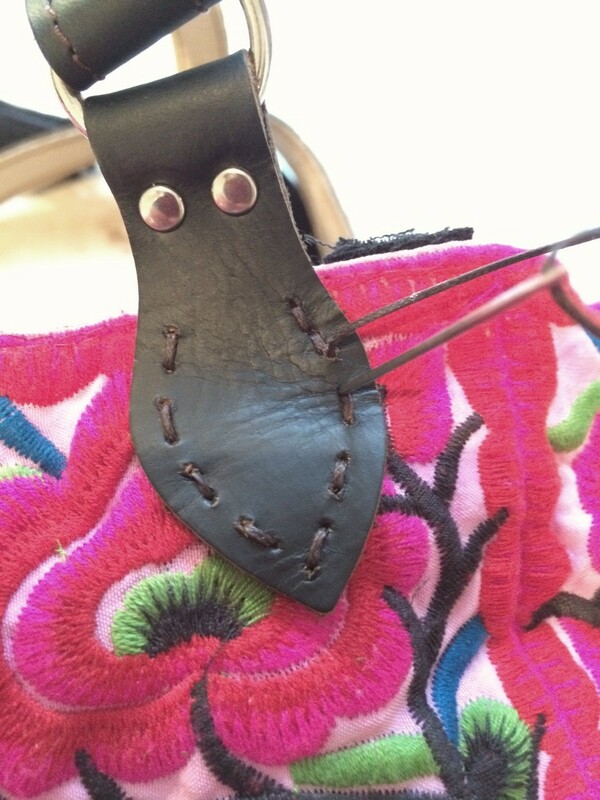 Great fix with those handles – I love that the bag got a second chance at life.